The Kinetics model type SVR is a stabilized or adjustable output, direct current, solid state, closed loop, fully controlled phase shifted, semi-conductor, heavy industrial rectifier system. The SVR has been specifically designed for those applications requiring a closely regulated DC output over a limited operating range. The basic SVR regulated rectifier system is designed to provide an economical and efficient means of converting AC power to DC power within a limited voltage range at full current capacity of the unit. Standard regulation range is 80% to 110% volts at 100% current. 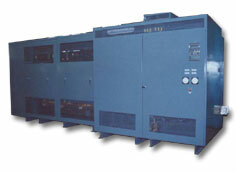 Below 80% voltage, current capacity is reduced directly proportional with reduction in voltage. 110% to 100% output voltage capacity is provided to accommodate low AC input voltage of up to 10% without loss of fully rated output capacity. Extended full capacity operating ranges are an available option. Standard output regulation is +/- 1% using voltage or current feedback over the regulated range from 10% to 110% load change and maximum AC line fluctuation of +/-10%. Tighter regulation is available to meet an application's requirements. Remotely supplied signal of 4-20 milliamps or 0 -10 volts DC. Remote point of reference for feedback control. Typical SVR system includes: primary disconnect, isolation dry type transformer, solid state logic circuitry, full wave semi-conductor bridge, annunciation package, robust AC and DC surge suppression networks and heavy industrial convection cooled enclosure. The stabilizing and load sharing capabilities of the regulated output SVR make the unit ideally suited for DC mill distribution power where the rectifier will operate in parallel with other regulated rectifiers, non-regulated diode rectifiers, motor generator sets or mercury arc rectifiers. Kinetics offers customers a wide variety of features and options with the SVR system to match an application's requirement from a basic 1 Kw unit to a mill distribution substation with AC and DC switchgear. Desired DC output voltage range. Desired mode of feedback regulation control or method.